In those cases where simple survival among the standard world becomes boring and not interesting for you, try this type of Minecraft PE maps. 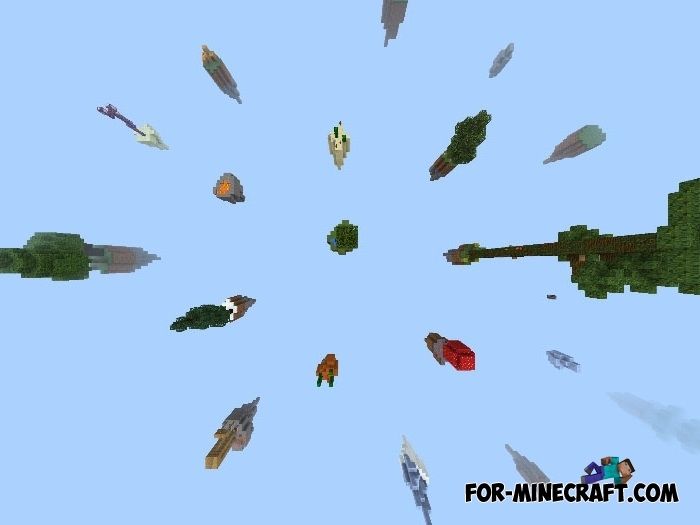 Sky Islands is a whole genre that includes many tiny islands hovering in the sky among the clouds. Each island is individual and is formed of certain blocks that can not be found on other islands. 1) Survival. but not as simple as the upper world, there is an acute shortage of resources and food. 2) Building a house. Due to the fact that there are very few resources on the map, you will experience construction problems that will cause your brain to develop a plan for resource collection and construction. 3) The discovery of all islands. There are not many of them, but to reach them you will need to come up with either bridges connecting the islands, or crafting objects with which you can get to the neighboring islands. 4) Having fun with friends. Survival has never been so difficult.